With a new Sony sensor, this two-channel dash cam sees well at night. Thinkware’s $300 Dash Cam F800 is the company’s latest high-end, dual-channel dash cam offering, and offers easily the best night video we’ve seen among all our dash cam reviews to date. If the author of a recent email to us on the importance of after-dark captures is reading—this is your camera. Like the F770 we previously reviewed, the F800 relies on a Wi-Fi connection with your cell phone for visuals and settings. If you’re accustomed to having a display, this can take some getting used to, but it’s certainly a less distracting arrangement while driving. Voice feedback and alert sounds fill the gap. The F800 is about the size of a deck of cards, if a bit thicker. Its silver-and-gray color scheme gives it a slightly more modern appearance than the F770. The right side of the camera is home to the video input (really a micro-USB port for a $110 optional rear camera) and AC jack. 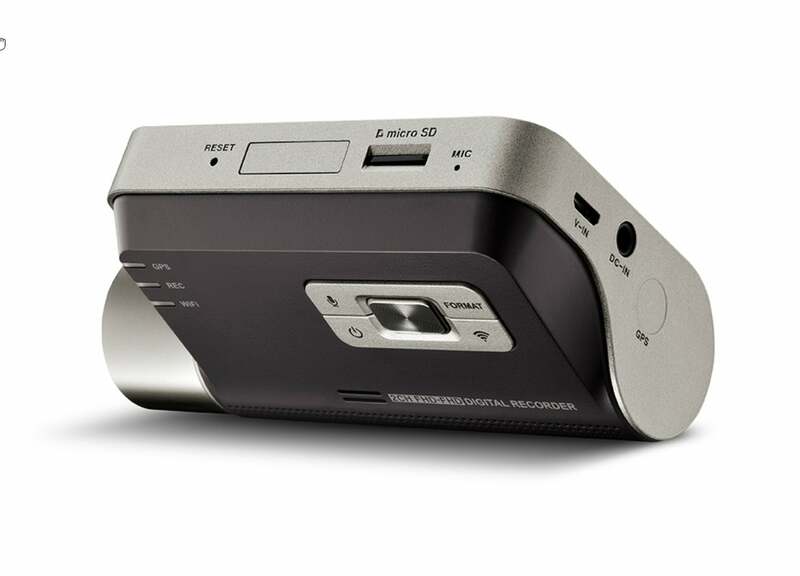 The top has the slot for the Micro SD card (Thinkware provides a 16GB card and SD adapter) as well as the reset button, while the camera is on the left side. The F800’s camera mounts very close to the windshield to reduce distortion, and swivels in the vertical with a range of about 90 degrees. The lack of a display is a bit unnerving at first, but control via a mobile phone app will appeal to cell phone-centrics, if not all traditional users. The side of the unit that faces the car’s interior has the power, microphone mute (for eliminating colorful verbal exchanges), Wi-Fi connect, and format SD card buttons. All other operations are performed using an app on your phone (iOS or Android). There are also indicator lights for GPS, Record, and Wi-fi so you can easily see the status of those functions. You might want to use a level to align cameras that mount via adhesive and lack the ability to rotate parallel to the plane of windshield. We didn’t with the F800 the first time. We had to redo it. Just FYI: Adhesive that is overly sticky when warm is a common mount issue, not one peculiar to Thinkware. On a mere 85-degree summer day, it was impossible to remove the protective film from the adhesive on the mount. A couple of minutes with the mount in a friend’s refrigerator solved that. On that tack: Thinkware rates the F800 to operate at temperatures up to 140 degrees Fahrenheit. That means denizens of the southern regions can leave it in the car with peace of mind, at least for the one-year warranty period. Linking the camera with the phone app is a tad circuitous. First you press the camera’s Wi-Fi button and connect the phone to the resulting Thinkware network. Straightforward enough. But then you disconnect from the Thinkware network, turn on your phone’s hot spot, and let the camera reconnect on its own. The why behind that hadn’t been explained by Thinkware at the time of this writing. Caveat: Remember to turn off the hot spot when you’re finished, or your phone’s battery will drain rather quickly. The F800 provides a number of “Advanced Driver Assistance System” or ADAS features such as lane departure and collision warnings, as well as a tardy departure warning. That is, if you’re asleep at the wheel as the traffic in front of you starts moving, you receive a gentle reminder to stop holding everyone up. We call them BDF, or Bad-Driver Features, as the truth is you shouldn’t be straying from your lane, tail-gating, or zoning out on your cell phone at the light. Consider that the video you take is a two-edged sword that could reveal your own bad behavior as well. On the other hand, the warnings about red lights and red light cameras, speed zones and mobile enforcement zones could help you channel your inner Baby Driver. All that info can make you feel incredibly well-informed, and who knows—maybe the feedback will improve your driving. We usually turn it off. Thinkware makes a big deal about the Sony Exmor R STARVIS (probably for Star Vision) sensor inside the F800's 140-degree camera, especially touting the images it produces at night. It’s only 1080p, but we’ve found that wide color gamut and high dynamic range (Thinkware calls it “Wide”) and processing have as much to do with a nice image as pure resolution. 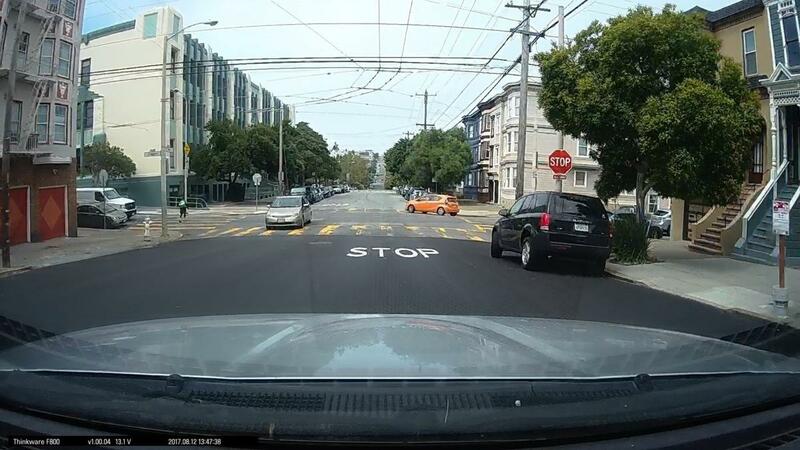 Most dash cam optics can’t do much with resolutions beyond 1080, and you wind up just wasting storage space, or using a compression level that undoes anything extra resolution can provide. The F800’s daytime video is good, comparable to that from other dash cams. 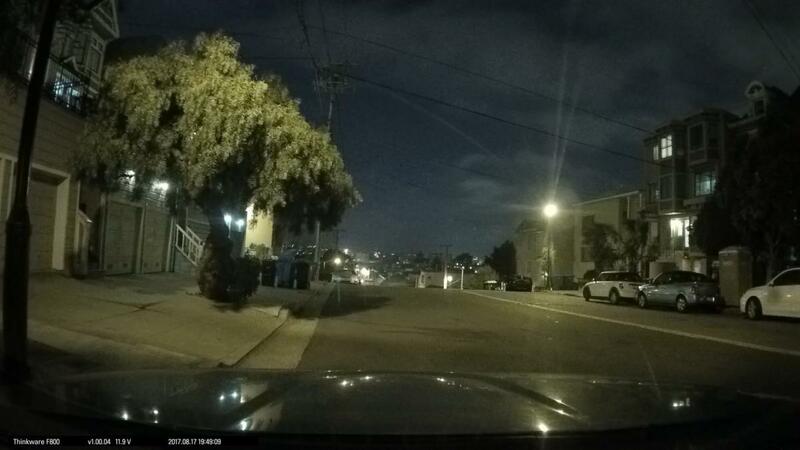 We captured daytime, nighttime, and something Thinkware calls Super Night Vision videos. The daytime video was quite good, though not quite up the wide color gamut video of the Viofo A119. However, as claimed, the night video was superb—better than any we’ve seen. 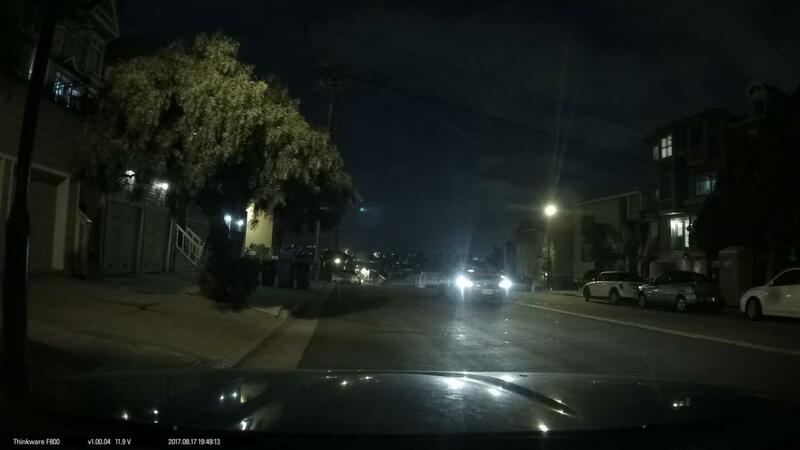 Super Night Vision compensates for the lack of headlights and as of the latest version in the F800, kicks in automatically in low light conditions rather than only when the car is parked, as previously. It helps quite a bit. The F800’s night video is so good, it revealed details that we missed with our own eyes while actually sitting in the car. The F800 will show more lens flare than this, but it recedes very quickly. The overall image readjusts to the ambient light level quickly as well. The 2 frames-per-second, storage-conserving parking mode video is equally fine, though that’s available only if you hardwire the camera to a constant 12-volt source. The F800’s night vision is superb, revealing things difficult to see with the naked eye. Thinkware cameras are expensive. They are also quite arguably the best, and the F800 is arguably the best of the best. For night use, ditch the qualifier—it’s absolutely the best we’ve seen other than the F770. As to the lack of a display...again, not having one is less distracting, and after a while, you don’t miss it. Much. Note: This article was edited for accuracy and the latest vendor information on Super Night Vision on 8/29/2017. Formerly, the article stated that SNV was only available when parked. It's now automatic no matter what the state of the vehicle. Note: 6/21/2018. In answer to a reader query, yes the F800 has GPS, but it's not watermarked on the video. You need an app available from Thinkware's site that will show you your location on a map.